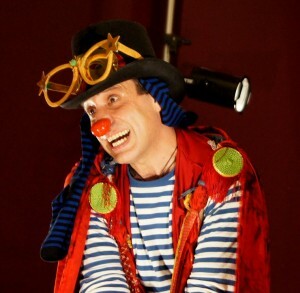 Actor, clown and director was born in Puerto Porvenir at Tierra del Fuego in the South of Chile. He started his professional career in Santiago, where he studied Production and Direction for Audiovisual Arts and where he got his training as an actor with the Masters Luis Wigdorsky and Fresia Astica. He worked for different theater companies in Santiago. He is one of the founders of the company Teatro del Viento which its main goal was to bring theater to the most in disadvantage communities in the city of Santiago. Later on he traveled to Europe and settled in Barcelona where he finished his training as an actor in the Institute Theater of Terrassa and with the masters Txiqui Berraondo and Manuel Carlos Lillo and studied for a period of four years contemporary dance with the master Anna Sanches at the Varium School Dance. He learned the clowns techniques working with the masters Pep and Bucoi Clowns, Cesc Serrat, Olga Colomer and Montserrat Casanovas. He also worked back stage at the facilities of the Dramatic Center of Valles and learned about sound, illumination, scenery construction and design from masters like Oriol Capellas, Miquel Font, Joan Ponce and Ricard Martinez. He learned about executive and technical production working with Montserrat Prat, executive director of Eteri Productions. He re launched his professional work in the cultural field of Catalonia and Spain for 22 years, working in different areas like acting, assistant director, set design and light design for theatre and dance performances with recognized artist and theater companies like Marta Carrasco, Pep Bou, Vania produccions, Juglars and The National Theater of Catalonia. As an actor in Barcelona we can mention his work creating and performing the theater dance show Altazor, which opened at the International Festival of Theater of Sitges. Also, special mention to his performance in the show Yepeto, directed by Mar de la Torre at the Theater Festival of San Sebastian. He carried out a very important mission in the field of pedagogical theatre, creating the Workshop for expression and creativity for children, implemented in various schools in the province of Barcelona. This workshop played an important role at the Special Educational School Crespinell, which focused on giving education to children with disabilities. In 2005 he traveled to the United States and since then he has settled in New York where he worked for five years at the Spanish Repertory Theatre in Manhattan as one of the main actors of the company in a total of ten different productions like Lorca in a Green Dress, Ana in the Tropics, Signed and Sealed directed by Rene Buch or The Feast of the Goat, Chronicle of a Death Foretold and Doña Flor and Her Two Husbands directed by Jorge Ali Triana. In 2010 he created Late Adventure Project, an organization of volunteering actors and clowns which its main objective is to promote attention to Primary Health Care and the rights to an education of underprivileged children through theater and the clown figure.